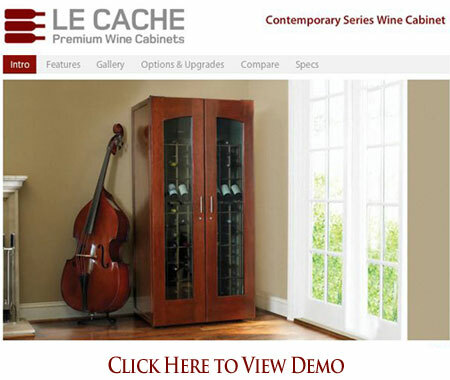 Le Cache Model 3800 Wine Cabinet Chocolate Cherry (P/N 738). Clean, contemporary design blends equally well with modern, Craftsman, Deco or Asian decors. Hardwood doors and gently arched windows showcase fine wine collections. Sealed seams, premium insulation and tinted double-paned glass provide thermal and UV protection.These options are included in the price of your wine cabinet. We just completed a major home remodel and we wanted to upgrade to a larger wine cabinet that also matched our new home decor. We could not be happier with our purchase. The cabinet has a beautiful wood finish and the cooling unit is very quiet. The racking dimensions and configuration are excellent for our large format bottles and irregularly sized 750 ml bottles. We have only had the cabinet for a couple of months but so far it is performing wonderfully and looks fantastic. Thank you, Le Cache, for your excellent customer service and beautiful wine cabinet. We bought the 3800 and can't wait to fill it up! The cabinet quality surpassed my expectations. The cooling unit is quiet and the controls do what they are supposed to do. Very impressed with this 3800. Phone support prior to and after order was fantastic! Our cabinet arrived in perfect condition and the two delivery people did a superhuman job in getting it into our home and installing it. It is a beautiful cabinet and, so far, it is working very well. The only wasted space is the space behind the door frame divider since we can only fit one bottle in that slot [though this space is not included in Le Cache bottle count figures]. Also, we are finding that some bottles are too long to place two bottles per slot (Don Melchor bottles). We have to angle these bottles.